After a stint in Nebraska with a sewing machine to make my new, fabulous, wonderful, keep-the-bugs-and-heat-out netting for the side and rear doors of the van, so I can keep a door or two open for breeze without letting the bugs (especially mosquitos) move in—after that, I headed up to South Dakota to not see Mount Rushmore. Hunh? I promised my mom we would see it together someday, so I have to skip the one and only major tourist attraction in the state for now. And I’ve got three weeks here that I need to fill before…well, I’ll tell you later. So, I spent quite a bit of time online looking for things I was interested in seeing in South Dakota, which will probably amount to two weeks of camping in the Black Hills, right around Mount Rushmore, without actually going to the place everyone assumes I’ll be visiting next. Seriously, if you can name off the top of your head more than two tourist attractions in South Dakota, other than Mount Rushmore, you’re ahead of the game. Before heading to the west of the state and the Black Hills, I found another can’t-miss event. At least, this got me super excited. 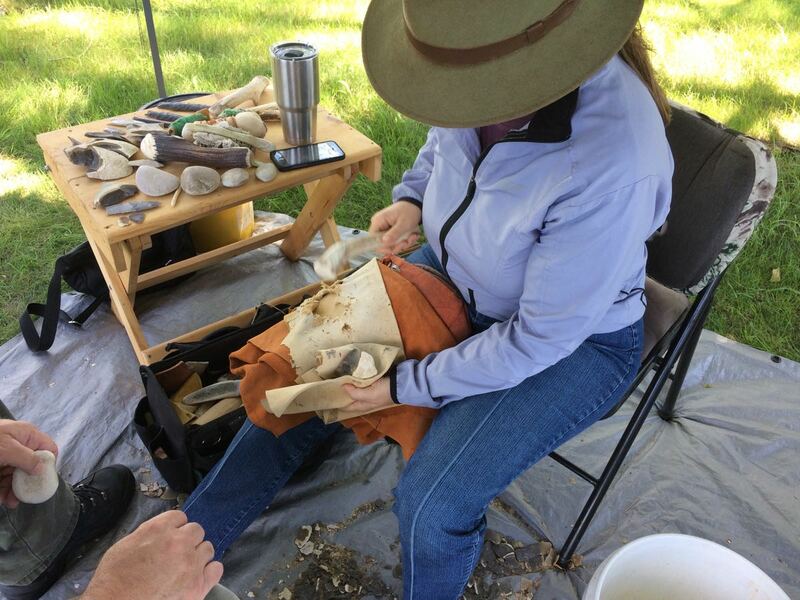 In Mitchell, South Dakota, there is an active archeological dig site and museum of a prehistoric Indian village, and they were having their annual Archeology Days event. A free, public, two day event showcasing demonstrations and hands-on activities based around prehistoric life and skills. Awesome! I was only worried it would be just a kiddie event. Things like this often say, fun for all ages, when they really mean, cheap crafts for little kids and we hope the adults like watching kids. What especially hooked me was that their website promised there would be a flint knapping demonstration. That one obviously wouldn’t be hands-on, but I was hopeful, perhaps naïvely optimistic, that if I asked nicely and there wasn’t a crowd, the flintknapper might let me try. This has been a bucket-list item ever since I first read Jean Auel’s Earth’s Children series. So I got to the event before it opened on Saturday morning, and first wanted to see what else there was to do, because if I did find a receptive flintknapper, I knew I’d be glued there and see nothing else. All the holes are areas where they have dug farther down. The entire ground used to be level with the observation deck, and over the years it has slowly been dug up (down). 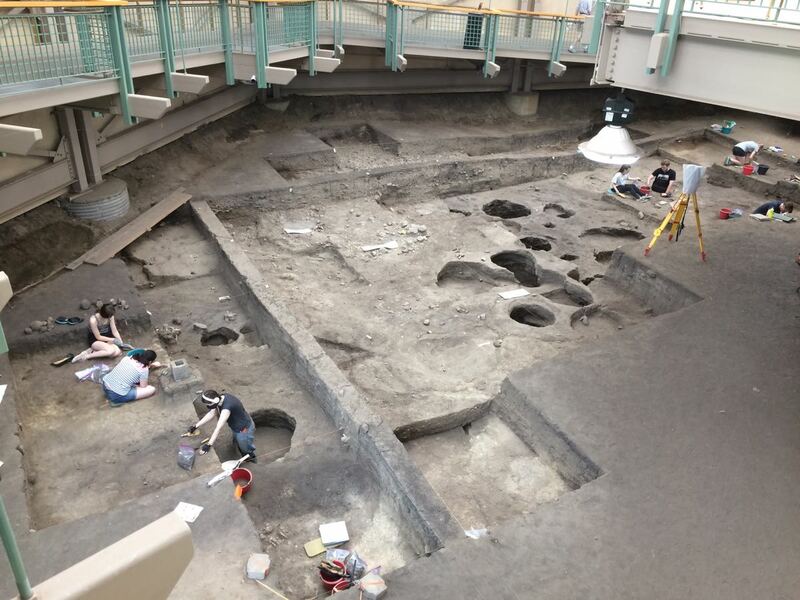 They are digging up the remains of a 1,000 year old village of people who were ancestors to the Mandan. A recreation of parts of the village was on display inside the museum, along with information about their lifestyle, based on previous digs here whose excavation has already been completed. There was also an atlatl throwing area, so for the second time in my life/in as many years, I got to practice with this prehistoric spear thrower. Since it was early, and there was no one else in line yet, I got in some good practice time. This was the range, maybe three hundred feet or so, not quite sure. After a lot of practice, I actually improved quite a bit. The cluster of arrows below were all mine. I didn’t quite have the power to get it far enough, although they were close, but my aim has definitely improved! 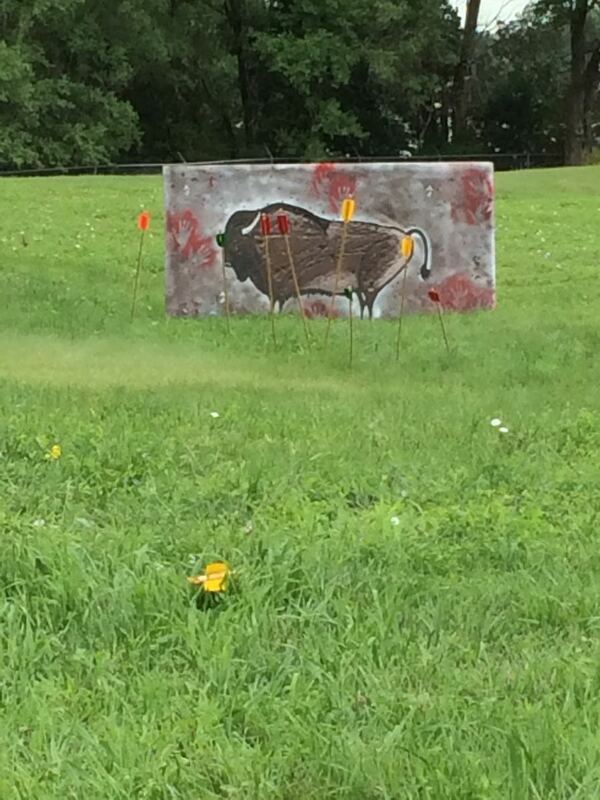 This cluster of arrows were all mine, including the yellow one that didn’t get nearly far enough. There were also Dakota and Lakota storytellers, and I enjoyed hearing the story of how the first drum was made. And a potterer who was making prehistoric pinch pots. And a leatherworker who was showing samples of her brain tanning and had activities around natural fiber dying and making a shell necklace. 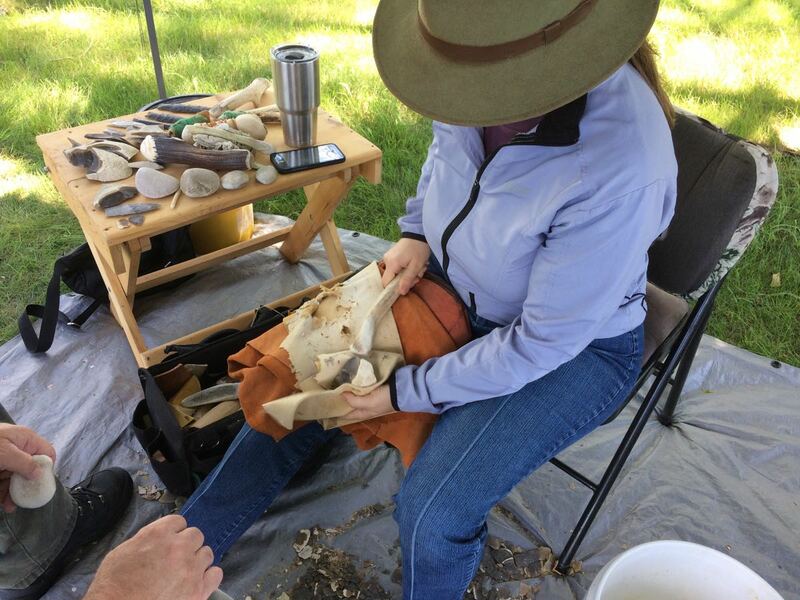 I was very pleased that in addition to some just for kids activities, like digging for plastic arrowheads in a sandbox, there were also some activities that were both kid friendly and scaleable to still be interesting for adults. Kids could play with clay by pressing it into animal shaped molds, and adults could try making their own pinch pot. That sort of thing. 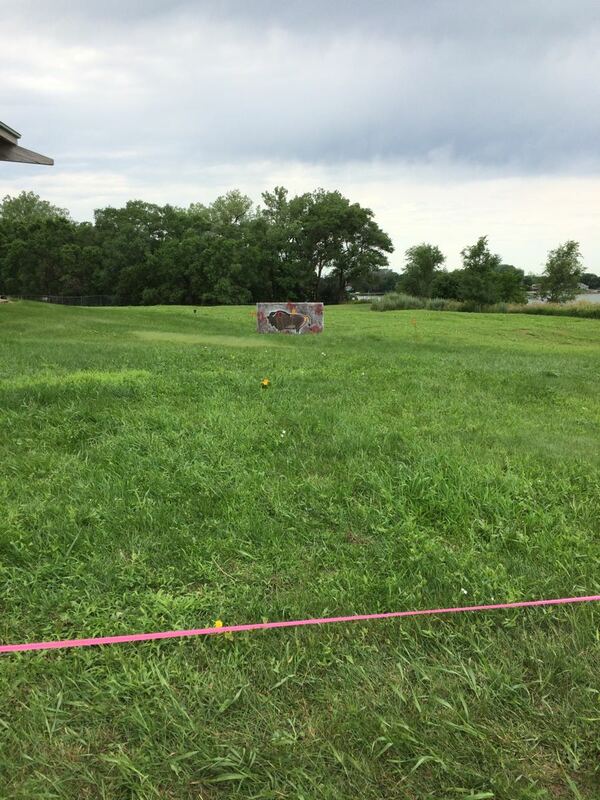 And everyone liked trying the atlatl throwing, but the older kids and adults were much more successful. It takes some coordination. After a couple hours seeing as much as I wanted of the rest, I approached the flintknapper when no one else was at his tent. That wasn’t too hard. I was also pleased that, though there was a fairly consistent stream of people both days, it was never really crowded. So. Flint knapping. I don’t know if it was my unbridled enthusiasm, my unabashed eagerness, if he could see that my request wasn’t a momentary whim. I don’t know what it was, as I heard him turn down several other requests to try it out that weekend. Whatever it was, he said yes! Jack Webster is a master flintknapper, having learned from a legend in the flint knapping community and been practicing his craft for more than 20 years. He had on display some of his work, including some highly skilled and gorgeous arrowheads in a few different styles, atlatls he made, and a display of the flint knapping process in stages. His wife was also there showing some of her native-style beadwork, which was likewise detailed and gorgeous, on leather bags she also made. Basically, I got to try it out for half an hour or so Saturday morning, with a little instruction and practice time, before turning the demonstration back over to Jack so that the visitors could better see what flint knapping is supposed to look like. I then made myself a nest at his feet, just out of range of flying flakes of flint, and watched enraptured for the next five hours or so until the event was over for the day, learning by watching and asking questions, and he was gracious enough to give me detailed and helpful answers. The next morning, I arrived early again and watched for another six hours or so and then got a two hour proper lesson in the afternoon! I was in heaven. The first day, Jack fashioned the arrowhead, also called a point, pictured at the top of this page. He wasn’t particularly happy with it as it wasn’t one of his better pieces, but I was duly impressed and learned a lot from the process. The second day he cracked open a new nodule and fashioned a biface, which basically means he broke away the unusable pieces of the outer crust and made a large, flat piece out of it. Prehistoric peoples would do the same thing, carrying the biface in their pack (not as heavy as the whole rock) to break off a piece for a tool whenever they needed a new knife or scraper or awl or arrowhead. 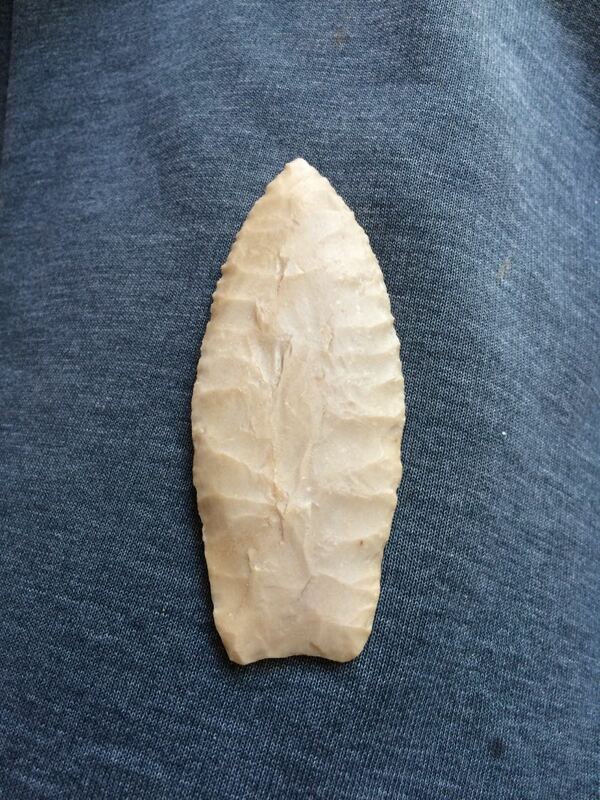 Jack called the biface the “prehistoric tool box.” You could make any tool you needed from it. Jack hasn’t taught much flint knapping, but he was a really good teacher. After the first few times, instead of just correcting me, he would ask me, “what did you do differently?” or “what happened when you did that?” instead of just explaining it. That made me have to think carefully about what I did and the results, and adjust myself instead of becoming dependent on him for all the answers. He would then correct and expand upon my answers, and show me something new or describe what to do in this situation and why, and I got a lot out of that practice session. We didn’t focus on making anything particular, just on learning how to strike the rock correctly to break off the flake I wanted, and what to look for to decide what to flake off. At the end of the lesson, I ended up with these two pieces and a lot of flaked off bits called debitage. 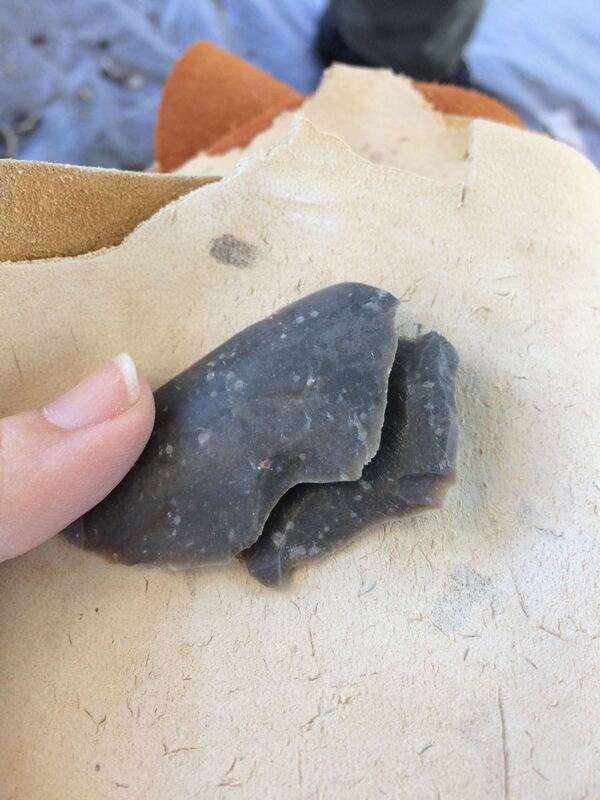 The basic point of flint knapping—get it, point—is to strike the rock in just the right place and with just the right force at just the right angle to break off a flake of rock that is the size and shape you want, without anything else happening that you don’t want. You then repeat that over and over to chip away the tool you intend to make. Each day when I left I furiously wrote down pages of notes with diagrams of everything I could remember he said about flint or knapping, what to do and not to do, terms, tools, where to find rocks, how to identify good flint—also known as chert—resources to learn more, everything. I will definitely be practicing! When a piece is sheared off, it is called a flake. This is a particularly large one, which took off a nice chunk of the white, outer crust of the nodule. That is chalk that built up around the flint over aeons, and you need to get rid of it to work just the flint. 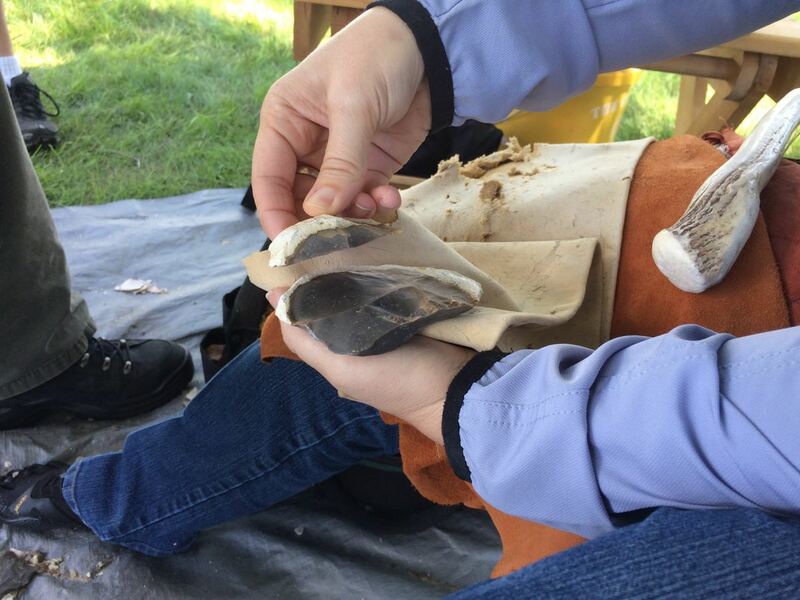 Flint knapping is a highly technical and subtle skill that takes years to get really good at. 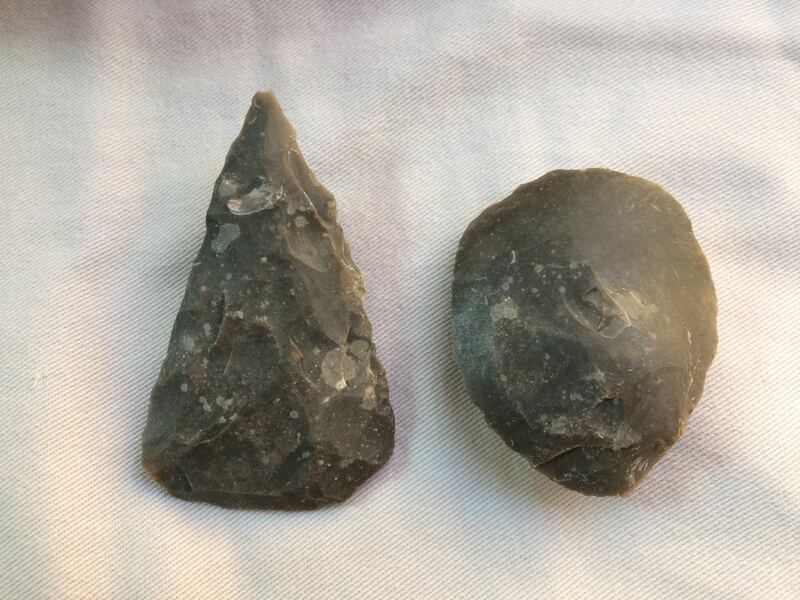 I won’t be making arrowheads (an advanced skill) anytime soon, and frankly am not really that interested in arrowheads. This isn’t some novelty craft to me; I want to use it. I’m not going to be bow hunting or atlatl hunting anytime soon, but what I can use it for, is making some of my own tools. Specifically, knives and awls. I got to take home a few flint shards, whose edges are sharper and thinner than the best steel blades that we can manufacture, with an edge that is only a few molecules thick. I’ve been using those flint knives for the past few weeks for everything except my food (it contains silica, which isn’t particularly good to ingest), and it feels so good to know that I’m cutting this piece of vinyl, or clothes tag, or electrical tape, or plastic packaging, with a knife that I made myself. That I can make it again when I need a new blade. That I am capable of making my own tools. Not in a survivalist or preparedness sort of way, or even in some kind of I-have-to-do-everything-myself way. I have no problem asking for help when I need it. It’s rather that I feel a need to understand the world around me, to know how it works and be able to make and fix things and not have to rely upon someone else because I don’t know what is wrong and feel helpless. That is a large part of why I wanted to convert the van myself, and wouldn’t have paid someone to do it even if I did have the money—which I didn’t. Doing it myself from start to finish means that I know intimately how everything works, how it all fits together, and when something breaks or I want to change something, I don’t feel at a loss because I know exactly how it was made in the first place and have the confidence to fix it or alter it on my own. That might sound like a need for independence, but it is really more of a need for understanding my world. The distinction is that it is not about ego. Just the opposite, it is about connection. Two flakes that come off right next to each other are serial flakes. Just three or four generations ago, it was completely within the reach of an average person in a normal lifetime to be able to learn enough about all of the things in their life to be able to make and repair almost anything they chose to, or at least they could understand how it all worked. Not everyone did so, certainly, far from it, but many people grew up learning how to make and repair their clothes, grow, gather, or hunt some of their food, make and repair some of their tools, help build and repair their houses, raise and take care of their (living) transportation, tell the time and find their way by watching the sun and moon, whether they lived on a rural farm or ranch, or in a tenement or house in the city. Of course, most people didn’t actually do everything themselves, but they lived in and among where everything was made, so that even when they didn’t do the blacksmithing, for example, many people knew the blacksmith and saw what was involved. They knew the farmer that grew the food they bought. They were familiar with the conditions of the workshop that made the nails they used. I realize that I’m oversimplifying and idealizing this scenario, but I think that, at a basic level, average, healthy, working class men and women throughout history until very recently had a much more visceral connection to their world than we do. In a very short space of time, from shortly before the turn of the 20th century, things got very complicated very quickly. With the discovery of electricity, the invention of the steam engine, and manufacturing centers being removed from where people lived and worked, inventions and improvements accelerated more rapidly than ever in history, making life very comfortable with many wonderful improvements. At the same time, we also have lost much of our connection to the things in our world. So much so that even talking about this probably makes me sound like an extremist or like I’ve gone off the deep end. But if your toaster breaks, would you know how to fix it? Would you even consider fixing it, or just be frustrated or mad, blame the manufacturer, chuck it in the trash and go buy a new one? And a toaster is a pretty straightforward piece of technology. Most of us have a broad knowledge of many things, but an in-depth knowledge of very few. Objects we take for granted on a daily basis, like the light switch or the refrigerator, not to mention computers and cell phones, are completely beyond most of us to fix or modify or expand upon or whatever. There are people who do know how each of these work, obviously, but inventions and discoveries are coming so quickly that keeping up with more than a small range of them is impossible. Electricians can’t fix their phones and computer programers rarely build computers anymore and we’re all going through life on faith that things will just work. Now that I think about it, this may be part of the reason why so many people get so mad so quickly when something doesn’t work. That makes sense if they feel helpless and disconnected from being able to do anything about it. I know I don’t like that feeling. The edges are razor-sharp and can be used as knives or scrapers. I’m not sure I’m brave enough to shave my legs with one of these, but they’re great for opening those hard plastic packages you can never get into. In my van I am liking the simplicity of having, for the most part, things that are fairly simple and manual and that I can understand, at least at a basic level. A jar is a jar. My water pump I couldn’t fix beyond a certain point, but I understand how it works. My manual blender is just three blades that I spin to chop food faster than I can by hand, but is not a mysterious box that turns on and off by means that I don’t understand. But it feels good. Like I’ve hit upon something I’ve have been trying to find all my life and I want more. I didn’t understand why until recently, and am only beginning to have the words to describe it. Connection. Relationships. These are important. So I am trying to slowly build a connection to my world by gradually learning how to do for myself. I learned some basic carpentry to build the bed and shelves for the van, some basic plumbing, insulation, electrical wiring, installed solar panels, did a bit of tiling, a lot of sewing—that I already knew—and a bunch of other little things to make this a livable and comfortable home. None of that is particularly extraordinary, but much of it is not ordinary, either. What I mean, is that none of that was beyond the capabilities of a short woman in not great shape with little to no experience, and so if I can do them, anyone can. But many of us are so used to getting everything we need prefabricated from a store and calling the appropriate technician to do any fixing or building jobs, that the thought of doing it oneself feels overwhelming, if not impossible. Yes, I used plenty of power tools (that was fun!) and got a lot of what I needed from hardware stores; this wasn’t a back-to-nature project by any means. That wasn’t the point. The point was to understand how my home is built by doing it myself and to feel a connection to it through the building. That part was definitely successful. 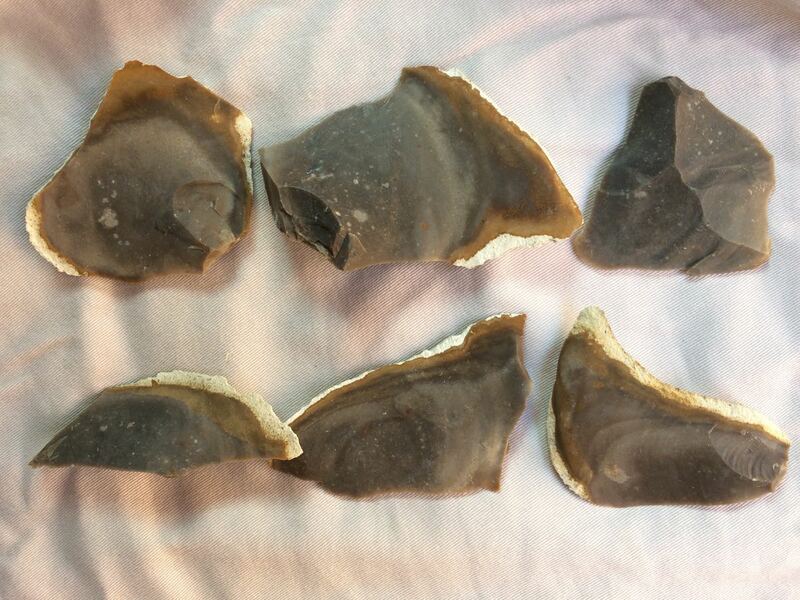 Now I am enjoying learning a few, even more basic skills, like flint knapping to make some of my own tools. I recently started making some of my own paper for journaling, which I will bind into books (I brought my bookbinding supplies with me), and have started reading a little about wild food foraging to occasionally supplement my diet, and about reading nature’s signs, since I’m spending more and more time in dispersed nature settings. I also want to learn basketweaving to make storage containers as I need them, and have a list of a few other basic skills I want to learn eventually. Notice that these are practical, useful things that I want to incorporate into my life; the motivation is not theoretical, this-would-be-good-to-know-in-some-possible-survival-situation. Yes, they’d come in handy if I got into a survival situation, but I hope to be sensible enough to avoid that. I want to learn this for my daily life, and, just as importantly, because I am having fun doing it. Right now that means making and using my own knives. I have no intention of moving into the forest and living off the land with only what I can find or hunt myself. I like modern conveniences too much. And I have nothing against electrical appliances. Really. I just want to make knives from rocks and baskets from sweetgrass and understand where my “things” come from and where they go. Will I ever buy a manufactured knife again? Probably. I don’t have to be all-or-nothing about any of this, and that is incredibly freeing. 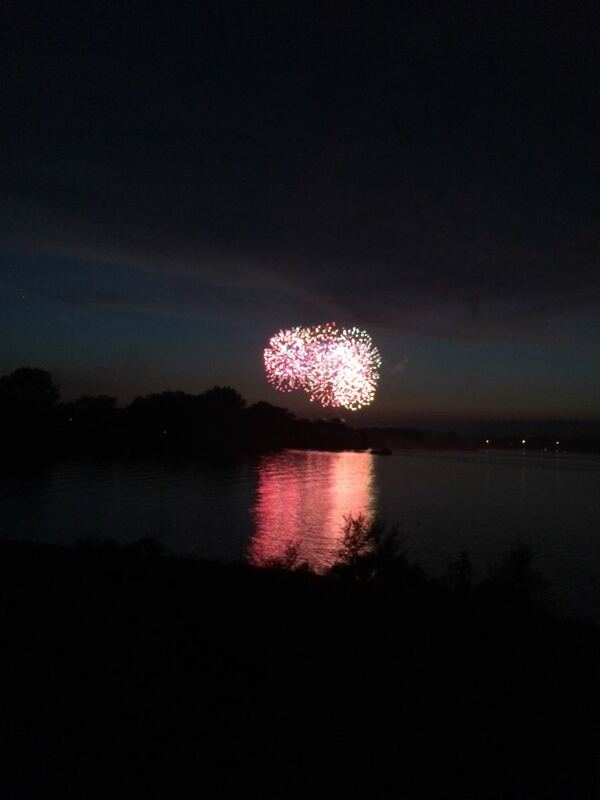 Another thing I like about modern life is fireworks. 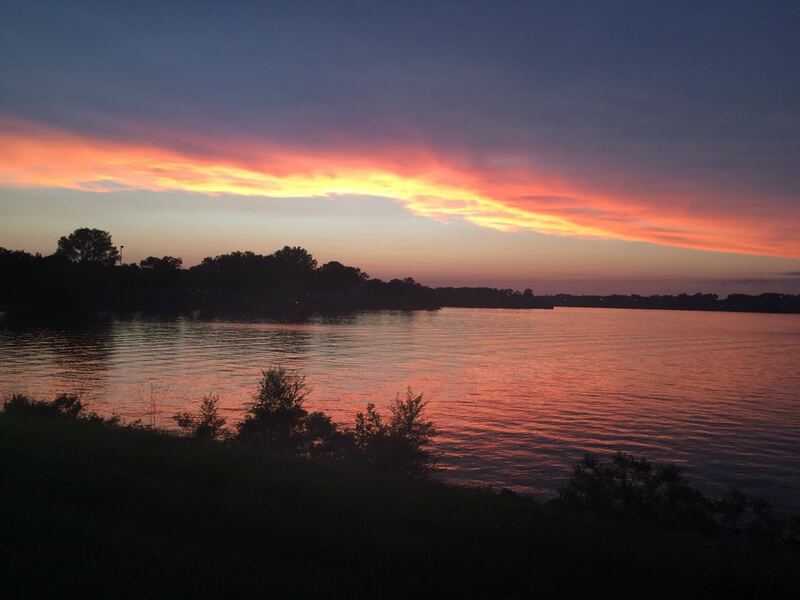 This was also the weekend before the 4th of July, and Mitchell, South Dakota, promised a spectacular fireworks display over Lake Mitchell, so I stuck around. 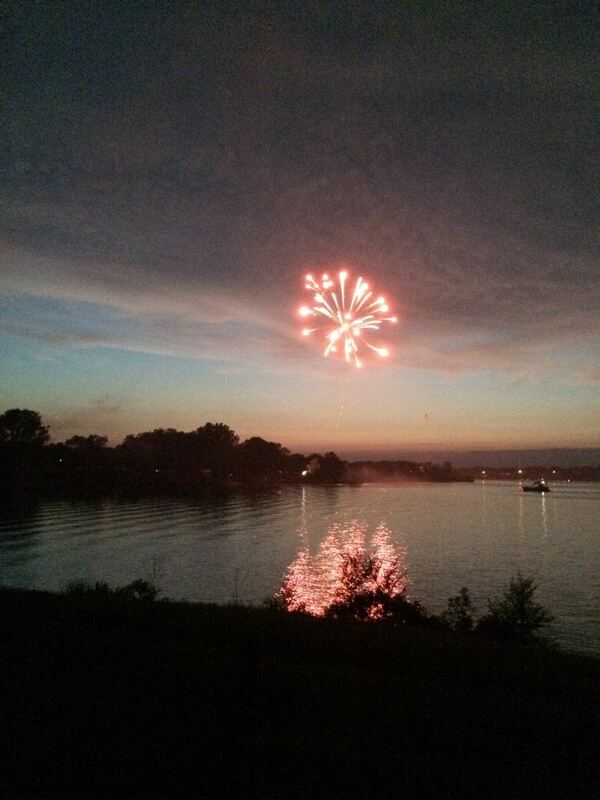 I love watching fireworks, and the locals didn’t oversell. It was indeed pretty spectacular. I drove around the lake early to pick out a good view. 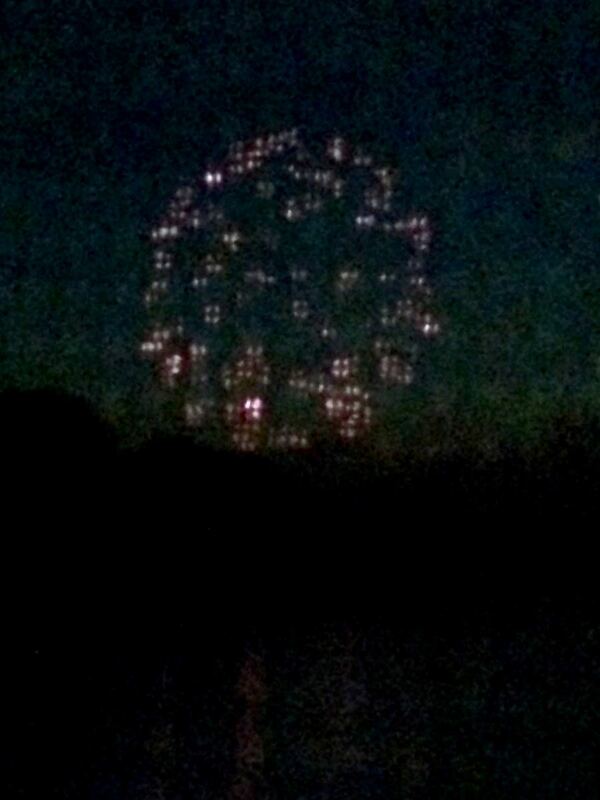 Looking at the fireworks through the new mosquito netting makes everything grainy. Oh, well. I’ll close with another pretty one. A restaurant called “Meat Lodge” flashed this sign in digital lights: “80% Burger” —Um, what is the other 20%? Coffee shop name: “Laté Da” —Made me smile. Maybe I’ll come back next year and show Jack my improved flint knapping skills! Two more weeks in South Dakota before….well, more on that later. In the mean time, I have an invitation to a powwow. I think this is so interesting, primarily because when I was rising my children we lived in the country and had to learn skills so that we were not dependent on others skills to make things work..come to think of it, where I grew up we were in the country and had to rely on our skills and not so much on hired labor. we had a large garden and raised our own meat and milk and chickens. also had a large area to hunt and fish. did a lot of canning, right up until I moved into the city. actually, my daughter and I are getting ready to can tomatoes in the next month. 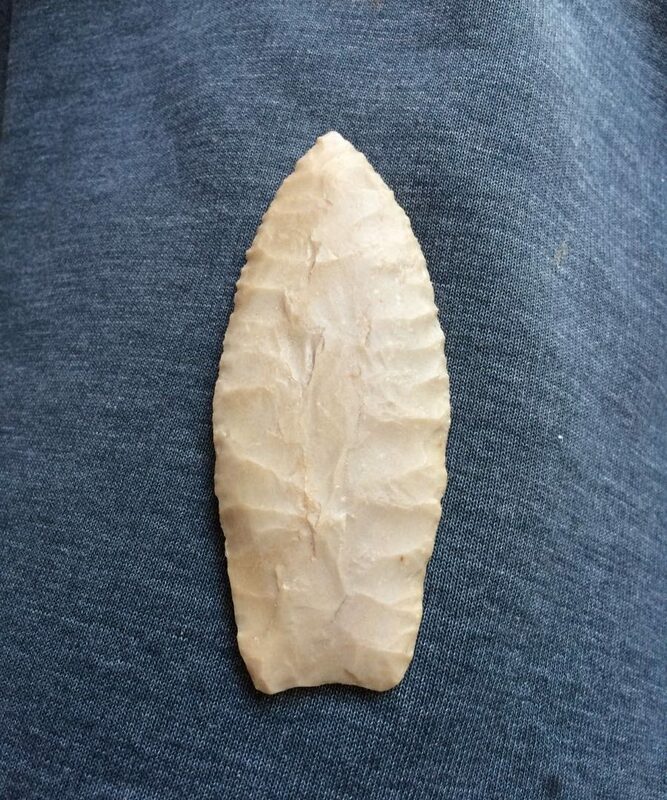 not quite making knives from flint but still using skills that are usefull in this world. when you can go to the pantry and pull out things that you have made yourself it is a good feeling. keep it up. one of the projects I do remember from my country days was having to find a leather piece that would fix my water pump. went all the way to maine for that piece. the water was sweeter for that. Yes, this is what I’m talking about. It does feel good, and the water does taste sweeter.